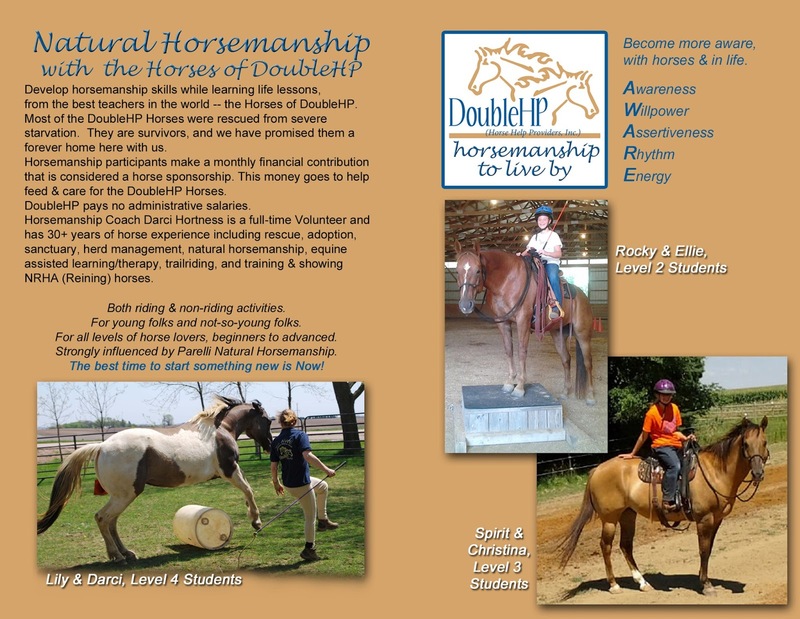 DoubleHP Horsemanship - "Horsemanship To Live By"
Let's raise money for 29-yr old OTTB HotShot in 2019. Great Xmas idea -- do a sponsorship in someone else's name. It's only $10 for a day. Although it costs us about $6,000 per year to maintain HotShot's health and happiness, you may sponsor him for a day for $10.00. Because, we have a very generous anonymous sponsor who is picking up the rest! And, because we get several hundred dollars worth of feed coupons from the Purina Horse Feed and A Home for Every Horse program. So, choose which day or days in 2019 that you want to sponsor HotShot on. And send $10 per day. And we'll let the world know how nice you are! Also consider doing this for someone else, for a Christmas present. Put a sponsorship in someone else's name. We will acknowledge all sponsorships on this website and also on our very active facebook page where we have more than 3,500 fans! or use our donate button here on this website. or, visit HotShot in person and bring your donation along! He would love to see you. we (Horse Help Providers, Inc.) are 501c3; donations are tax-deductible to the full extent allowed within law. 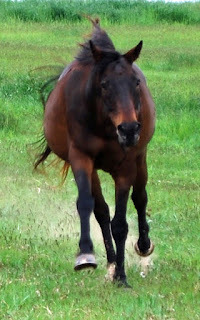 HotShot is a rescued OTTB and lives at our sanctuary, New Hope Horse Shelter, near Sioux Falls, SD. in memory of our friend Peggy Kessler. Peggy was an avid sports fan, as well as a talented participant. In high school and college, Peggy participated in basketball, volleyball, track and softball. She graduated from SDSU in 1981 with a B.S. in Public Recreation. Peggy loved playing softball from 1977 through 1988, helping her team win 2 state tournaments, and was inducted into the South Dakota ASA Softball Hall of Fame in 1990. Peggy officiated volleyball for 21 years and was the first volleyball official to be named NFIOA Outstanding Official for South Dakota in 1990. In 2008, the SDHSAA presented Peggy with the Officials' Leadership Award from the SD Girls and Women's Sports. Peggy loved her family, her friends, and meeting new friends. When not at work, Peggy could be found out camping, riding horses, golfing, watching football, traveling, geocaching and just being outdoors. After being diagnosed with Pancreatic Cancer in 2001, Peggy was an advocate through the Cancer Treatment Centers of America and the Pancreatic Cancer Action Network, answering countless emails and phone calls to offer help and support to others. Peggy also hosted 7 golf tournaments to raise awareness and funding for Pancreatic Cancer. In 2009, she received the Randy Pausch (author of the Last Lecture) award presented by the Pancreatic Cancer Action Network in Washington, D.C.
Peggy had a love for not only people but also for her horses. She wanted a horse from the time she was in kindergarten. Her mom saved every Christmas letter Peggy wrote Santa asking for a horse. Peggy would like the idea about rewarding good behavior and getting kids more involved in the outdoors and to appreciate nature and all its animals. If Peggy could have lived and camped outside every day she would have. I know Peggy would be very honored (about the Peggy Kessler RideOn Award). Enclosed is a check in memory of Peggy Kessler. She loved her horse and all horses. Now she can ride every day. We thank Jana and all of Peggy's friends and relatives who contributed to the original memorial donation. We also thank Mary Lou Dahms and Christine & Douglas Jacobson for individual gifts in memory of Peggy. The original amount came to $555.00. The owners of New Hope Horse Shelter, Greg Schjodt and Darci Hortness, matched that amount. Instead of just buying hay with the memorial money, we wanted to make it last and grow. So, we started the Peggy Kessler RideOn Award, a kind of scholarship for people in our horsemanship program. Original donations to the Peggy Kessler RidoOn Fund are used to buy hay for the rescued horses who live here. The matching funds from Greg and Darci are used as the scholarship part, to help with the horsemanship program we have here. Greg and Darci will match up to $5,000.00 for 2018. If you are interested in contributing to the Peggy Kessler RideOn Award, you may call Darci 605 359-0961. 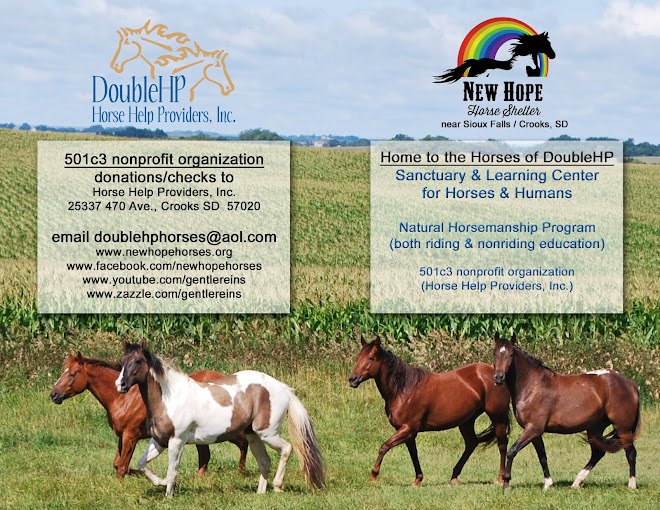 Send checks/notes to Horse Help Providers, Inc. (DoubleHP), 25337 470 Ave, Crooks SD 57020. Or use the donate button on this website. 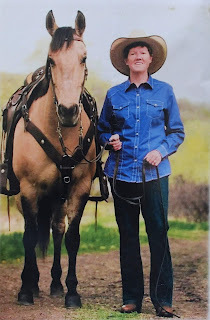 Darci played softball with Jana and Peggy, and Greg & Darci often visited with them while riding horses on the Newton Hills trails. Or ran into them on the golf course or at other sports/outdoors events. If you would like to add to this Memorial, or start your own, just let us know. Just call 605 359-0961 or email doublehphorses@aol.com if you have any questions or suggestions. Thank you. 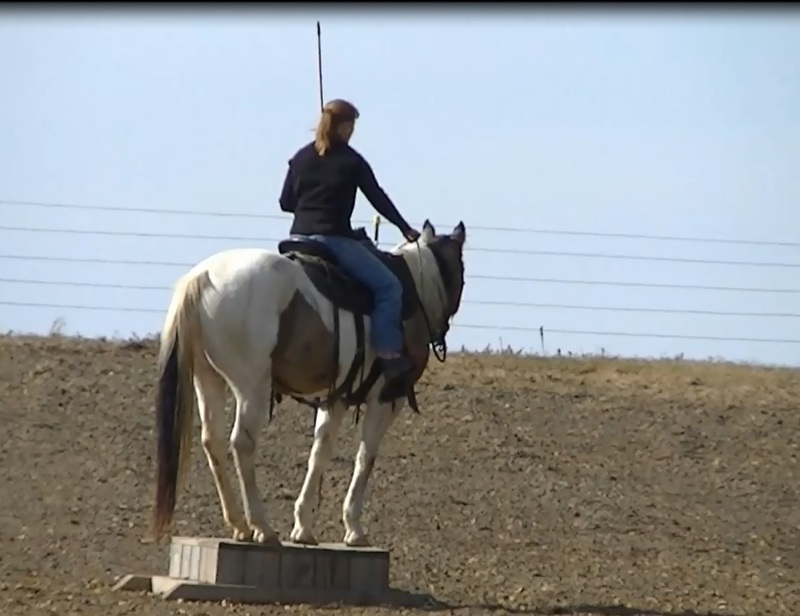 Horsemanship / Horse Riding Lessons in Sioux Falls, South Dakota area. at DoubleHP / New Hope Horses. Are you looking for a place to learn about horses in the Sioux Falls South Dakota area? Here we are! Our horsemanship program is getting a little later start this year. But it is time. This year we have an application for you to fill out. Our program is a little different than others, so we want to make sure it is what you are looking for. Ours is not just riding lessons. It is riding lessons, but it is also horse safety, care, behavior, and non-riding activities. If you don't want to ride, we have lots of non-riding activities and programs too. We encourage and reward greater participation, dedication, and try. Come more often, learn faster, lower your hourly rates. We provide the horses, saddles, etc. First, take a look at our horsemanship audition videos at www.youtube.com/gentlereins. These are videos right here at our facility with our horses. 1. 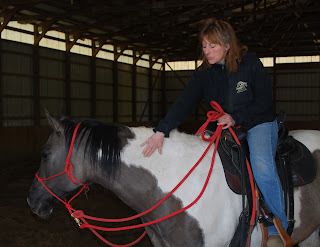 Watch our horsemanship / audition videos at www.youtube.com/gentlereins. These are some of our horsemanship students in the last few years, right here at our facility, with the horses who live here. 2. Look at your schedule, to see if it will work with our schedule. At first, we want you to come 2-5 times a week. Twice is fine, if that is what works for you. We schedule in advance, on a monthly basis. Sessions are 1- 2 hours each. They are scheduled M-F. Start time can be between 10:30 a.m. and 4:30 p.m. It is our goal that as you advance through our program you will need less supervision/coaching and your schedule can become more flexible. Our weekends here are reserved for advanced students. If you have recently received your certificates for Level 3 online and freestyle, you will probably very quickly receive a great deal of schedule flexibility here, low or no costs, and the opportunity to help coach our beginners, if you would like to. If you are just getting started or are a beginner yourself, that is something to look forward to! Previous Horse Experience - There is no previous horse experience required; however, if you have quite a bit of horse experience, you will probably speed through our first two levels. Age - There really is no age limit. We have riding and non-riding programs, so you don't have to ride if you don't want to. If you are younger than 18, we need to involve a parent or legal guardian in all of this planning. For youth 12 and under, we require an adult to participate in the sessions with the youth, at least for the first few sessions or until we all feel comfortable with the youth being here without the adult who brings the youth. We have had children as young as 6 in our program, but it can be difficult at this young age. Weight & Height - This is important for riding and saddle-fit purposes, but not so much for non-riding activities. Our beginner- approved riding horses are medium sized, so beginner riders cannot weigh much more than 170 pounds. For advanced riders, we do have a couple of bigger, younger horses that might fit you. These horses need further training before they are beginner-approved. So if you are advanced, perhaps you will be interested in these horses. Physical, emotional, and mental fitness - Are you fit enough for a 2-hour session with a horse? You don't need to have any previous horse experience to do this. But you need to be able to focus on what we are teaching you without having thoughts about other things that will distract you from learning and practicing. You will need to develop non-stop awareness and be willing to find and use an appropriate level of assertiveness. This is a self-improvement program for humans. Yes you will learn horsemanship skills, and you will ride if you want to. But you will also explore (and hopefully enjoy) new ways to communicate, move, excel, and have fun with a horse (and actually with life in general). If you enjoy music, rhythm, dance, either individual or team athletics/sports, you will enjoy this with horses. If you don't know if you like those rhythmic things, you can find out here with the horses! When something isn't going quite right between a human and a horse, usually there is something the human should do differently. It's hardly ever the horse; it's almost always the human. Once you get to that realization, your advancement will be incredible! This is why we talk about fitness. Physical, emotional, and mental. Here is the info. on the application. We can email it to you, or you can just copy/paste the info. here. Email it back to us or send to DoubleHP, 25337 470 Ave, Crooks SD 57020. Our "how to sign up . . ." sheet will help you complete the rest of this form. What kind of schedule are you looking at? Summarize your horse experience, no matter how basic or extensive that may be. No previous horse experience is required, but we like to know about it if you have some. What are your main areas of interest or goals or reasons for joining our program? After reading about rhythm and fitness (physical, mental, and emotional) as they relate to our horsemanship program, please write about any experiences, thoughts, questions, or concerns you have regarding those topics. Anything else you want to tell us or ask us about our horsemanship program. 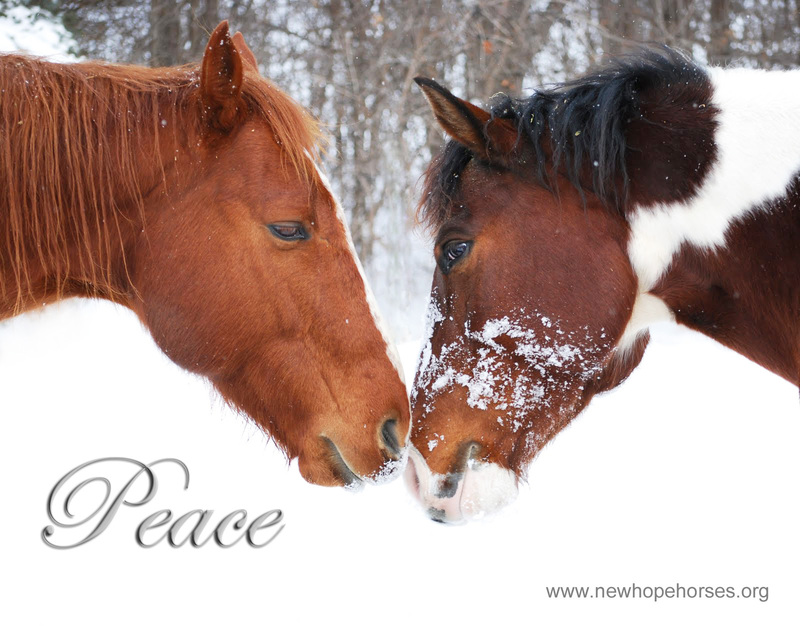 Merry Christmas from our rescued beauties Jet and Prince, and all of the other horses and humans at DoubleHP / New Hope Horse Shelter. Every Day is Giving Day here. We give to the horses, and the horses give to us. Today is "Giving Tuesday. " But here at New Hope Horse Shelter, every day is a Giving Day. 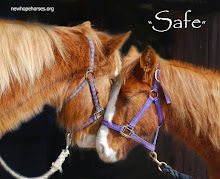 We give to the horses by caring for them and loving them. And the horses give to us, in so many ways it's hard to begin explaining. Let's just say they teach us how to get along in life, if we will take the time to learn from them. The easiest way to give to our rescued horses on Giving Tuesday or any day is to make a deposit directly into our bank account. We have already received $14,000 in matching funds. That's what our hay costs us for the year. We buy early, in June/July, before the prices get so high. This year was actually a really good hay year around here, first cutting anyway, for people who planned ahead and bought early, that is. Can we match the $14,000 on this Giving Tuesday? that will replenish our hay fund for the next year. Just use the Donate button on this, our web page. Or, of course, when you shop Amazon, use this Amazon Smile link for our organization. Thanks! Princey got a surprise visit from his boy, Paul. Princey and Paul first met in 2009. Paul had gone through several heart surgeries, and one of their Doctors had recommended animal therapy for Paul's family. And so they found us. And Princey. Princey was one of our very first rescues. We rescued him from starvation when he was a yearling. Princey has arthritis in his hocks, probably due to malnutrition as a baby. Princey and Paul are really good friends. Even when Paul doesn't visit for a while, their relationship picks right back up each time he does come to visit. Paul's sister Christina planned a surprise visit for the 2 of them. She thought it would be good therapy as their family prepares for another open heart surgery for Paul. Scheduled for Oct. 12. Princey and Paul had a wonderful time together yesterday, as they always do. You know the story: the one about the guy who throws something in the trash and the other guy who comes along and finds it, lifts it up out of the rubble, cares for it, and treasures it forever. Lily is my treasure. She is also my Parelli Partner and, as of September 2016, we are official Level 3 graduates. Together. And so, on a cold South Dakota February evening, my husband, Greg, and I went on yet another horse rescue adventure. We picked her up at the Humane Society in a neighboring county. She looked like a shriveled up pony and she also had that other look -- the one that says, "I have lost my dignity, my pride, my beauty, my strength, my only friend, my life; now do with me what you want." The day after Lily's rescue, our Veterinarian came for evaluation. Lily, then a 3-year-old, had a body condition score of 1, her halter was growing into her head, she was loaded with worms, and she was lame. For the rest of that winter, Lily lived in a barn with as much hay and water as she wanted. We promised her she would never again be without food, water, and shelter. We did put Lily up for adoption the following spring/summer, but no one wanted her. She was still not sound, she was very protective of her food, and we could not guarantee that she would be a riding horse. And so, she came to live at our horse sanctuary, New Hope Horse Shelter, where 14 of our rescued beauties live. I believe that we are never too old to learn something new, and that the best time to start something new is now. Starting a new journey -- going on an adventure -- can be scary and, yes, as we get older, it can be even scarier. But you know, I know, Lily knows, if you never go on an adventure you might never find your treasure. Our barn Parelli videos can be found by searching gentlereins on YouTube. If you are interested in joining our horsemanship program, call me. Darci. 359-0961. 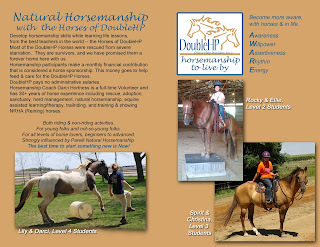 Shop at Amazon through Amazon Smile, & Amazon will donate to DoubleHP (Horse Help Providers, Inc.) every time you shop! 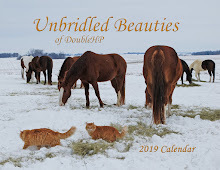 our 2019 calendar, Holiday cards, logo shirts, and more! 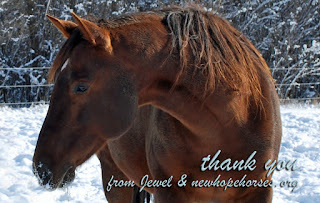 join some (more than 3,500) of our friends on facebook - New Hope Horse Shelter, where 14 of our rescued horses live. Develop excellent horsemanship skills, and practice & evaluate your human communication ideas -- all at the same time! Both riding and non-riding activities. No previous horse experience required. Our horses will show you everything you need to know. About life. We do this in our horsemanship program at DoubleHP.